ZAPINAMO (pronounced ZAP-IN-A-MO), a Coventry based Electric Vehicle [EV] Charging infrastructure innovations company, has developed a patented EV Charging system utilising Battery Stored energy to 'Power Boost' a nominal Grid supply into a rapid or ultra-fast charge unit. This reduces the amount of time it takes to replenish the EV battery. Typically, a home charge unit will provide 4 miles of charge per 30 minutes into the EV battery, whereas a ZAPINAMO HUBZ unit power boosts it to 50 miles in 30 minutes from a domestic supply. The ZAPINAMO HUBZ product range is created out of a modular system which can expand capabilities as the EV parc develops. www.zapinamo.com. Being able to Power Boost a normal 3 or 7kW supply to enable delivery speeds of not just 50kW but upward of 350kW to meet the EV market's emerging high-speed charging needs and wants. ZAPINAMO HUBZ already deliver 50 miles of range in just 30 minutes from battery stored renewables and trickled grid supply. This is developed out of patent protected innovation in power electronics and battery storage with advanced processes enabled through InnovateUK and collaboration with industry and academic partners including WMG, at the University of Warwick, who is one of the founding consortium partners for the UK Battery Industrialisation Centre. Until now, charging a large battery EV at home has been simply slow and impractical. Typically a home charger will provide about 4 miles of driving range for every 30 minutes it's plugged in claims ZAPINAMO However the ZAPINAMO HOMEHUBZ system aims to provide up to 50 miles of range in the same time. The HUBZ base unit will Power Boost a normal household supply to provide increased power and also utilise a 'Community' energy model to collate and distribute energy when required. 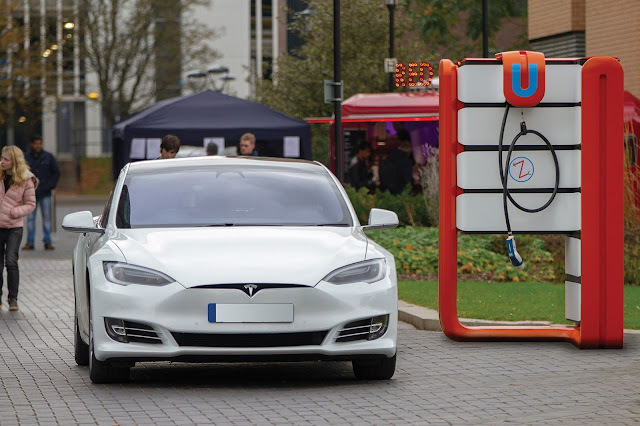 ZAPINAMO hopes to also transform a kerb mounted 7kW Charge point in to a Rapid STREETHUBZ unit without further substation upgrade, support or planning, and will work well in commercial depots where substation upgrades can run into hundreds of thousands of pounds of unforeseen costs. The PARKHUBZ unit is ergonomically designed to 'fit' in to the corner of car parking bays without reducing vehicle access or taking more than a parking bay. This is typically a 20% reduction in a normal car park for traditional rapid charge units when implemented. With PARKHUBZ it's zero tolerance to oversized space consuming charge units. ZAPINAMO aims to improve air quality and therefore public health. As well as saving billions in healthcare costs. The ZAPINAMO technology already in operation at HEATHROW Airport shows an estimated saving of over 22 tons of CO2emissions in the last 3 months and continues to power EV Private Hire and Taxis, all day every day. The introduction of ZAPINAMO HUBZ provides the world with a healthy alternative to traditional EV charging. Extending the reach of renewable energy and even home and community distributed micro solutions through the most thorough connectivity developed for the EV world. ZAPINAMO introduces EVIE™, the Electric Vehicle Information Exchange system which uses 'Herringbone' AI and ML techniques to reach the most distant of information sources to capture availability of energy and maximise it for the end user needs. Satisfying DNO, Commercial and Domestic users.